Image caption Chaidh an clàr-ola air na creagan air taobh siar Leòdhais san Lùnastal. 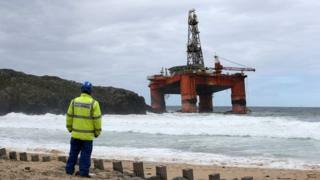 Tha a h-uile coltas ann gum faodadh an clàr-ola Transocean Winner a bhith air bòrd an t-soithich a bheir i a-mach às a Loch a Tuath ann an Leòdhas anns na làithean a tha romhainn. Chaidh obair a thòiseachadh Diardaoin gus na h-acraichean aice a shaoradh, agus tha an luchd-salbhaidh an dòchas gum bi i deiseil 'son a dhol air bòrd an OHT Hawk tron là Dihaoine. Chaidh an clàr-ola air na creagan air taobh siar Leòdhais san Lùnastal, nuair a bhris càball a bha ga ceangal ri bàta-slaodaidh ann an stoirm. Thuirt Riochdaire an Riaghaltais, Uisdean Seathach, gu bheil iad air a bhith a' feitheamh ùine a-nis 'son a' chothrom seo agus gu bheil an obair-deisealachaidh a-nis seachad. Thèid an clàr a thoirt chun na Tuirce airson a bhriseadh às a chèile.